Jack Koras '20 was named our Student-Athlete of the Week for March 27 – April 3. We hosted a joint press conference with Calvert Hall on Monday, April 1, announcing our plans for Turkey Bowl 100. Kaire Umoja '20 was named our Student-Athlete of the Week for March 20–27. Garrett Mobley '19 was named our Student-Athlete of the Week for March 13–20. Four Dons recently received All-MIAA honors for the winter sports season. Congratulations to our Dons for a great trip to the 2019 New Balance Indoor Nationals this past weekend. Ronan Sullivan, Camden Gilmore, Connor Verrett, Kyle Clarke, and Aaron Ray will represent Loyola at the New Balance Indoor Nationals this weekend. Our freshman basketball team was crowned 2019 Baltimore Catholic League Champions after defeating Archbishop Spalding 57–35 in the finals on Feb. 26. Steve Truitt was recently named Head Wrestling Coach of the Year for Maryland Independent Schools. Loyola Basketball Head Coach Josh Davalli was named Baltimore Catholic League Coach of the Year during the Awards Banquet on Feb. 18. Several of our Dons also received honors. Our basketball program recently hosted its 6th Annual Coaches vs. Cancer Night. Brett Stoll '21 and Ryan Kness '22 were named our Student-Athletes of Week for Jan. 30 – Feb. 6. The MIAA Swimming Championships took place Saturday, February 2, at McDonogh School. 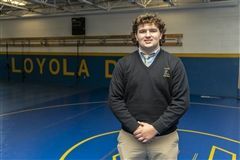 Jack Kinkead '19 was named our Student-Athlete of the Week for Jan. 24–30. Several members of our Indoor Track team won and placed in their respective events at the 2019 MIAA Indoor Track Championships on January 18. Our Student-Athlete of the Week for Jan. 16–23 is Aaron Ray '21. Will Pelton '19 is our Student-Athlete of the Week for January 9–16. Bennett Traurig '19 is our Student-Athlete of the Week for January 2–9. Mike Finley has been tapped as the new head coach for Loyola Rugby. Tryllian Young '19 is our Student-Athlete of the Week for Dec. 26 – Jan. 2.